Yes, I fully support this move, for obvious reasons. It’s no secret my views on China. The rude, disrespectful, and uncivil conduct on the international stage, the constant blatant violations of international law, the groveling, whining, and playing the victim when they get caught and called out for expansionism, espionage, and encroaching on other nations’ sovereignties, and so much more. Plus, China is a totalitarian dictatorship that kidnaps, terrorizes, and murders anyone who speaks out against the Chinese government’s crimes against humanity. And, there’s also the little matter of them evidently trying to invade Vietnam, doing so by currently destroying Vietnam’s environment including forests, highlands, coastal waters, etc., killing off Vietnam’s food supply, poisoning Vietnam’s water supply, sending in staggering numbers of undocumented Chinese “workers,” and many more things beyond the scope of this article. There’s also that. So, yes, I am not a fan of China. 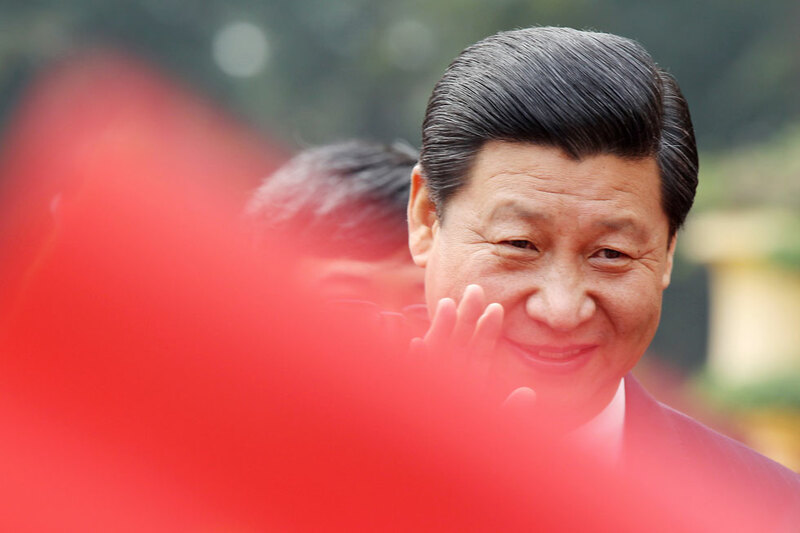 China is a threat to international stability and peace, and is, by these measures, a threat to the free world and liberal democracies everywhere. For this reason, I argue that U.S. President Donald Trump’s recent approval of a plan that allows the U.S. Navy more flexibility to act and react to happenings in the South China Sea is a very, very good thing. 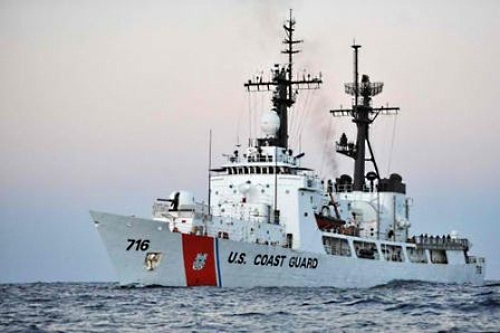 US President Donald Trump approved a plan giving the country’s navy greater freedom in operating in the South China Sea and put pressure on China’s efforts to enlarge its military presence by artificially building reefs and atolls in the area. The move is seen as a challenge to Beijing’s maritime claims over most of the South China Sea and its attempts to overrule overlapping claims by five other countries, Vietnam, Malaysia, Indonesia, Brunei and the Philippines. The new plan, which was submitted by US defence secretary Jim Mattis, involves a full-year schedule of when US navy ships will sail through contested waters. It seems that under the new U.S. president, China will no longer be able to freely violate international law, throw its weight around without consequence, and make a mockery of international cooperation in a shamefully belittling way that only China is capable of doing. As per usual, China is employing their time-tested strategy of playing the victim and complaining vociferously while at the same time ignoring all claims and evidence of their wrongdoing. China has responded forcefully to US incursions into the region, telling the US the moves were provocative and that they must ask permission, which doesn’t align with international law or UN conventions. “China’s military will resolutely safeguard national sovereignty, security and regional peace and stability,” China’s Foreign Ministry said in response to US bombers flying in the region. Over the last few years, China has ambitiously built up islands on reefs and atolls in the South China Sea and militarized them with radar outposts, military-grade runways, and shelters for missile defenses. Military analysts believe China hopes to expand its air defense and identification zone into the western Pacific and build a blue-water navy to rival the US’s, but six other countries also lay claim to parts of the region. Seriously, how stupid does China think the rest of the world is? You remember in elementary school, there was that kid who tried to steal your chocolate milk on the playground, but then ran away crying and snitching to the teacher after you got up and broke his nose? That kid is China. China is the crying snitch with the broken nose. Always plotting, stealing, and sabotaging other nations, then playing the victim when they get caught or called out. That’s China. Pathetic. I’m glad the United States is finally doing something about this China problem. I know a lot of you may not be the biggest fans of President Trump (myself included at times), but when he does something right, credit is given where credit is due. Get ready, East Asia, because America is back. According to multiple news outlets, China, the self-proclaimed “superpower” who is demanding that everyone in the world respect them, took it upon themselves to openly “snub” President Barack Obama at the G20 summit in Hangzhou this past weekend. Chinese leaders have been accused of delivering a calculated diplomatic snub to Barack Obama after the US President was not provided with a staircase to leave his plane during his chaotic arrival in Hangzhou before the start of the G20. If you thought this was childish, and unbecoming of anything remotely close to the realm of “superpower” behavior, or the behavior of any self-respecting man or woman, for that matter, then you’re completely right. This behavior is not the behavior of a civilized nation, a self-respecting nation, and definitely not the behavior of a nation who assumes the role of a world superpower. I was disappointed and irritated by the news of what the Chinese did at the G20 meeting in Hangzhou, but I wasn’t surprised. They’ve done this before, numerous times, in numerous countries, in numerous different ways. What the Chinese did to Obama in Hangzhou is just one example of China’s belittling attitude towards the international community, and another reason why China is not a superpower. Not even close. China is bitter, insecure, and self-conscious at the fact that they are not a superpower. As a result, they are doing whatever they can to project the appearance of superpower. Sadly for them, in trying so hard to appear “superpower-ish”, they’re making themselves look very, very small. It takes more than military might and economic clout to be a superpower (although America smashes China in both of these areas). To be a superpower, one does require these elements, but it takes so much more. America is a superpower, not only because of her military and economic power. She is a superpower because of her superior ideals, her belief that all are created equal, and that we are all born with a set of inalienable rights that can never be taken away from us. America is a superpower because she stands by these ideals, because she champions these ideals, and when abroad, her representative, exemplified in the form of President of the United States of America, adheres to these ideals, no matter how lowly and contemptible her adversary is willing to sink. There are a number of ways President Obama could have handled this situation. For him, the decision was a graceful shrug, a smile, and a step above his unruly hosts. In response to this incident, Obama replies that he “wouldn’t overcrank the significance,” according to Australian news outlet ABC Online. I may not agree with everything Obama has done during his time in office, but the way he carried himself during this instance was pure class. The Chinese tried to demonstrate their “strength” by trying to embarrass Obama publicly, and he rebutted them by simply reaffirming what the Chinese have already affirmed themselves: That the leaders of China are small men, with short fuses, and little understanding of the word “respect,” for others, and for themselves. By shrugging off this rude gesture, Obama shows the world that he is too big to be fettered by such small actions. In maintaining his dignity, patience, and stature, Obama, without as much as saying a word on the subject, clearly explains why America is the world superpower, and why China is not, and never will be. As the presidential race heats up, many of us (or maybe it’s just me) are wondering what the candidates’ stance on China will be. Mitt Romney has already made his ground clear on the matter, pledging to take a tougher position on the PRC as currency manipulators and thieves of intellectual property. From what is shown so far, Governor Romney has taken, or promises to take a hardline stance on the Chinese, and shows no reservation on sparking a “trade war” with the Asian giant. According to Mr. Romney, we won’t be “starting” a trade war with China, we are “already in a trade war” with China. What about President Obama? Prior to his presidency, Mr. Obama’s stance on China was neither friendly nor hostile. In the words of the president (before he was president), “They’re [China] neither our enemy or our friend. They’re competitors.” In the same statement, President Obama also stated that his presidential aims were to establish relationships with the PRC and help stabilize the region. From this point of view, the president’s stance in previous years were less cynical, and more optimistic. This optimism however, will change after his inauguration, and a swift change in policy would quickly follow. President Obama would quickly learn the hard way that nice guys finish last. After being harassed by the Chinese Navy in the Southeast Asia Sea in 2008 (the Impeccable Incident), snuffed by the Chinese leadership at the Copenhagen Summit in 2009, and the ongoing issue of currency manipulation (just to name a few), the president’s stance on China would take a turn for the strong. After his return from Copenhagen, President Obama would sell billions of dollars in arms to Taiwan, a direct response to the Chinese after Copenhagen. Beijing responded with waves of hostility and harsh words, which the president coyly brushed off. This was just the start, however. 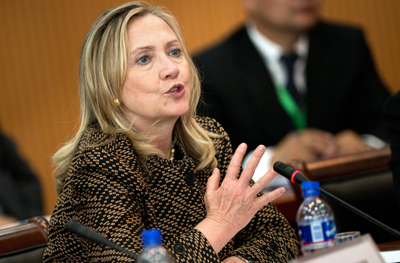 In the latter half of 2010, U.S. Secretary of State Hillary Clinton made a statement in Hanoi declaring the Southeast Asia Sea a “national interest” of the United States, a statement that greatly angered the Chinese, who were desperately trying to keeping the U.S. out of Asian affairs. The Obama administration would then release statements saying that as time goes on, the U.S.’s role in Asia would only get bigger. Earlier this year, January 2012, the president would make promises to bring jobs back to America and launch investigations into China’s unfair trade practices. Considering the president’s actions in the past several years, the Obama Administration’s stance has become quite clear. Where does this leave Governor Romney? For now, we can only say that his stance on China looks promising. He has for a long time made strong statements in favor of punishing the Chinese for their poor conduct on the international stage. However, one must be wary of any promises made by politicians. This is a lesson in history. Even President Obama has broken a few promises made during the presidential race (Guantanamo Bay, anyone?). Who knows, it is possible that Mr. Romney will follow through on his promises of punishing the PRC for their disregarding of their colleagues in the world stage. However, it is also a possibility that promises of economic development and favorable trade agreements with China may lure the Republican nominee away from his initial goals. Regardless of which party, instances like this have happened before, and quite frequently in politics. To put simply, I believe that Governor Romney makes an appealing case against Beijing. If he were to follow through on these promises and not collapse under the many pressures that come with being the most powerful man in the world, then I am all for it. 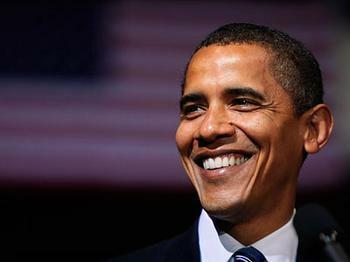 My position on President Obama is that he has proven himself through the various actions outlined above. Furthermore, he has shown much more teeth in dealing with the Chinese than many of the presidents before him. For this reason, and for this particular issue, it seems more likely that our current president, Mr. Barack Obama would handle China in a more effective manner. 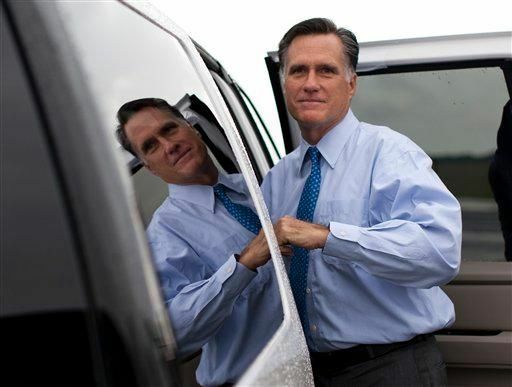 Nonetheless, Mr. Romney has made an attractive case in the China issue. If he follows through on his plans, then America will benefit greatly from it. 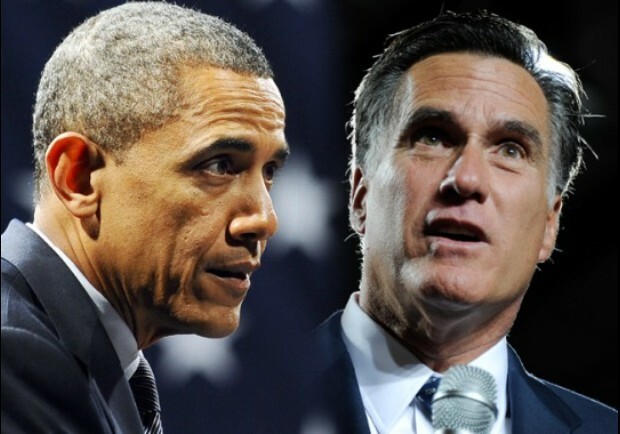 Can Mitt Romney take the presidency from Barack Obama? Besides China, the American economy is a big issue right now, and Governor Romney has made some strong statements about creating work for Americans. Will President Obama be able to counter Romney’s attacks on his business credentials? There is still a long time before election day this November, what do you think? Tensions have been flaring between the Philippines and China over a topic we know all too well: sovereignty in the Southeast Asia Sea. As China continues to pursue its rapacious claims over the entire sea in Southeast Asia, one country has stepped up to challenge the Asian giant’s “indisputable” claims of “indisputable” sovereignty, which, along with every other claim China is making, are “indisputable.” This gutsy contestation comes from China’s little neighbor to the east, the Philippines. The incident began in early April, when Filippino authorities spotted eight Chinese naval vessels stationed near the Philippines’ Scarborough Shoal. 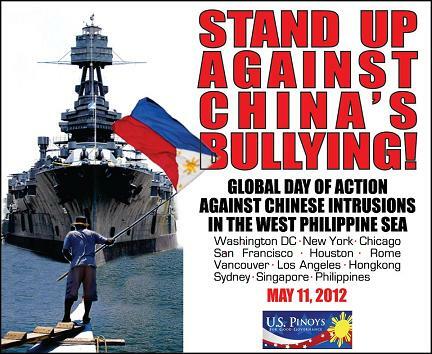 What followed was a four day standoff between the Philippines and China near Filippino territory, from the identification of the Chinese ships on 6 April 2012, to the near detainment of these vessels on 10 April 2012. To this day, the diplomatic crisis between China and the Philippines remains unresolved, as neither country shows any sign of backing down. China’s government and state-run media agencies continue to threaten the Philippines with economic and military retribution if the country continues to resist the assertions of the PRC. China has increased, and continues to increase, the number of military vessels deployed near the disputed Scarborough islands, which the Chinese call Huangyan. Tourism from China to the Philippines have been blocked, and the Chinese Embassy in Manila continues to accuse the Philippines of violating China’s “indisputable” sovereignty. Meanwhile, the Filippino people have gathered in protest outside of the Chinese embassy, sending their message to the Chinese government. They carry with them signs saying “Stop Chinese Aggression Now!”, “China Back Off!”, and the like. The Philippines government has also taken a tough stance against the PRC, standing by their people in the face of Chinese aggression. The country has made military purchases in preparation of armed conflict with the PRC. Weapons have been purchased from the U.S., with further transactions planned with Japan and South Korea. Even with these new military expenditures however, the Philippines will still be no match for China in terms of military capability. The People’s Republic of China exponentially dwarfs the Philippines in military spending. Materially, the Philippines does not stand a chance against China, the giant to the west. That being said, the Philippines has taken the necessary steps to defend the rights of their people. Though they are outclassed and outnumbered, the Philippines refuse to bow down to the demands of a foreign bully, putting them leaps and bounds above the Communists in Vietnam. 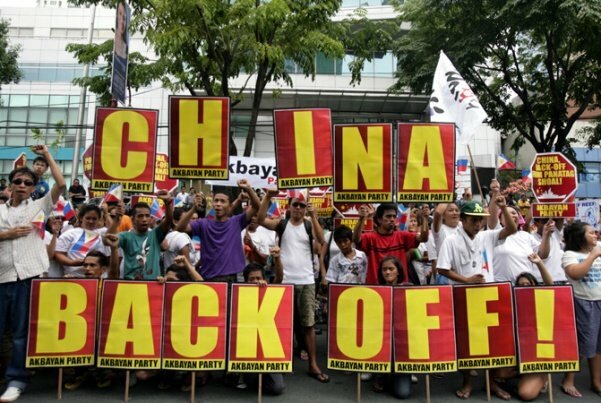 Unlike the Communists in Vietnam, who refuse to stand up to the terrorist activities of the Chinese navy, the Philippines is not afraid to speak out. When the Chinese military kidnapped and terrorized the fishermen of Vietnam, the VCP remained silent on the matter for months at a time. Any attempt by the people of Vietnam to stand up for their fellow Vietnamese were met with heavy repression by the Communist Party in Vietnam. Even the brief protests permitted by the Vietnamese government last summer have been quashed for fear of a vengeful PRC. Put simply, Filippino President Benigno Aquino has resoundingly accomplished what Nguyen Tan Dung was too cowardly to follow though with. China may be stronger than the Philippines for the time being, but the Philippines has the world on its side. The Filippino people are fully in support of their government in defence against China, and continue to do so with no hesitation. Furthermore, the basis of the Philippines arguments are based on international law, which follow the guidelines of the international community. China’s rebuttal of “indisputable” historical claims remain to be proven, with the recurring term “indisputable” as their only source of defence. As long as the Philippines stays firm in defence of its people, China will have a very difficult time in Southeast Asia. The following is footage of one of the most severe cases of violence and destruction of Vietnamese properties at the hands of illegal Chinese laborers. Though this incident took place quite a while ago, December 28, 2008, it is definitive to what has been happening, and still happening in Vietnam today. The coverage and dialogue is all in Vietnamese, but worry not, for I can walk you through the entire video, right here. This particular incident took place in the province of Thanh Hoa, at a local business owned by Mr. Nguyen Van Den, on December 28, 2008. In the interview with Mr. Den, he clearly outlines how the incident went down. Six Chinese laborers entered his convenience store, opened up some packaged goods of his, and refused to pay. When confronted by Mr. Den’s wife, a fight broke out between her and the Chinese. When Mr. Den intervened to stop the altercation and protect his wife, the Chinese goons attacked him as well. It did not end there however. When the Chinese goons returned, their entourage had grown from six to forty, their only purpose to rip the store apart and further terrorize the shop owner. The outcome, total pandemonium as Mr. and Mrs. Nguyen were violently beaten by a mob of foreign delinquents. The angry mob grew even larger as the riot went on, from 40 to 200 illegal workers. Not only did they destroy Den’s store completely, but they didn’t feel satisfied until his whole family was black and blue. Den’s business was ruined as a result, his family, and even some of his neighbors and friends were left bloody and bruised on the street. Around the three minute mark of the video, the interview switches to the Vietnamese police chief, Nguyen Nhu Nhan, who, shamefully enough, is trying to rationalize the incident on the Chinese’s behalf. He was defending the Chinese in the incident, accusing the shopkeeper of being the aggressor. Furthermore, Nhan outlines the events of other such incidents up to that point, taking the Chinese side on all of the events, claiming that they were the victims in each situation. This police chief is a prime example of a Communist lapdog, bowing down to China and turning his back on his own people. It is a sad, sad truth that many Vietnamese citizens have to put up with this kind of harassment from these violent foreigners every single day. The scale of violence may vary depending on the incident, this was probably one of the worst cases. Regardless of the degree of destruction, such reckless and violent behavior should never be condoned by the Vietnamese government. Even if one Vietnamese citizen was subjected to this kind of treatment, the government should come to their defense without a hint of hesitation. Sadly, this is not the case. As you have seen, the Vietnamese police were completely useless in the matter. They are only good for one thing, suppressing the Vietnamese people. This time, the Chinese are already doing it for them, so they don’t have to lift a finger. Vietnamese Communists. Shame. Here is something that I hope many of you will find interesting. 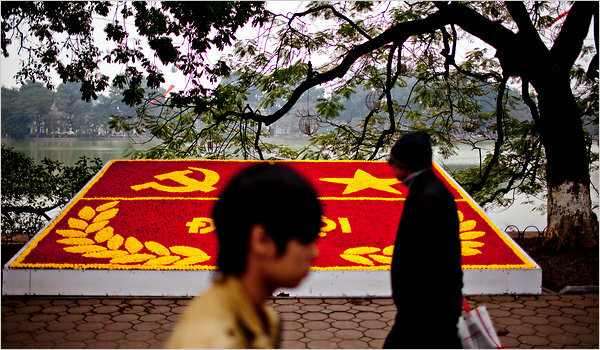 There is word going around from some analysts, suggesting that the Communist Party of Vietnam is going bankrupt. This is more than speculation, but since the Communist system is built upon nothing but lies, it is a very real possibility. How can this be? Isn’t Vietnam one of Asia’s second fastest growing economies, only behind China, with an annual GDP growth of 7-8%? Maybe, but maybe not. Let’s talk about China for a moment. 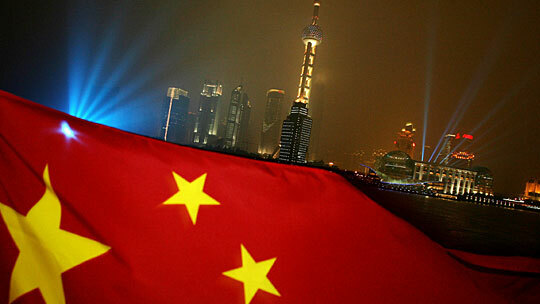 It is widely believed that the Chinese economy is one of the fastest growing economies in the world. Strong GDP figures, healthy numbers on the Consumer Price Index (CPI), and so on. But hold on a minute, how do we know that these figures are what the Chinese Communists say they are? An article by Taipen Daily editor Justice Litle puts these figures directly into question. According to Litle, many of China’s claims to economic growth are strongly exaggerated, even to the point of outright fabrication. In his article, “China Has Reason to be Terrified” (February 25, 2011), Litle goes over the discrepancies in China’s statistics on economic growth, looking at the reasons why the numbers just don’t add up. To further strengthen his argument, Litle quotes the words of a Li Kequiang, China’s prominent political insider, who refers to the statistical figures as “man-made” and “for references only.” To summarize, it is possible that the stats for China’s economic growth, as released by Beijing, may be completely untrue. Though we may not be able to prove it yet, the ferocity of China’s economic growth may be fabricated. Furthermore, it is possible that the country is more of a paper tiger than is generally perceived. Let’s now look back at Communist Vietnam, who, to the chagrin of your’s truly, always seems to be following in Beijing’s footsteps. Nowadays, it is believed that Vietnam is the new up-and-coming economy in Asia, with a strong annual growth and ever-increasing market strength. This general perception, like that of China’s, may also be nothing but pure bull. Not only is Vietnam’s economy not what its leaders claim it to be, but its condition may actually be worse. Exponentially worse, as a matter of fact. Unlike China, who may still have the investment and economic clout to sustain itself, the smaller economy of Vietnam might not even have enough money to keep its economy afloat for much longer. As a matter of fact, many believe that Vietnam’s economy is set to collapse in the not-too-distant future, taking the Communists with it. It seems that the Communist regime is not as sustainable as the fools hoped it would be. Vietnam’s Communist dictators are starting to run out of steam, taking so much money out of the economy that the system itself is now in jeopardy. Though it is not positively certain that the Communists are on their way out, one should still feel joy in the possibility that their impending collapse may happen very soon. Vietnam is in need of a revolution, and this need grows steadily stronger with time. Double digit inflation is plaguing the Vietnamese economy, and this new evidence of statistical fabrication only strengthens the possibility that the Communists are losing grip of their own system. This may be the breaking point of the Communist regime. It is obvious that they’ve pushed the people too far, but it seems that they are pushing the system to the limit as well. It is only a matter of time now, Vietnam’s revolution may not be far away.